Historian Sandra Myers identifies the role of women in several communities along the trail. Among the agricultural peoples of the Pueblos, women built and owned the houses, cared for the children, prepared and gathered food, produced pottery and cooking utensils, and made clothes. Among the semi-nomadic peoples, including the Kanza, Pawnee, and Osage tribes, women were responsible for garden plots, some food gathering, food preparation, and making clothes; Comanche, Kiowa, Apache, and Cheyenne women of the Plains were responsible for the domestic arrangement of the camps, in addition to food preparation and clothes-making. American Indian and Mexican women not only lived along the Santa Fe Trail, but they also traveled on it and in some instances, married American traders and trappers who operated on the trail. African-American women served as cooks and personal maids for some travelers. Several New Mexican women became steady customers of the merchants who operated over the trail. These women merchants included: Manuela Rosalia Baca, Luisita Baca, and Senora Linda del Sargento Sanchez. 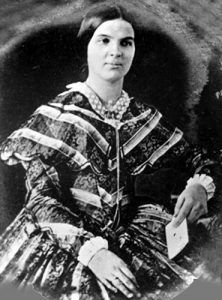 Gambling queen and astute businesswoman Doña Gertrudis Barceló, also known as “La Tules,” operated a saloon in Santa Fe during the 1830s and 1840s, is credited with a significant role in New Mexico history and the Santa Fe Trail. American, Mexican, and Spanish women had been present along the trail in small numbers since at least 1829. 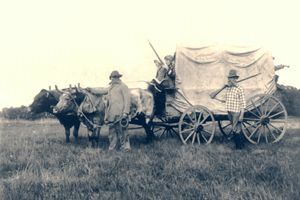 In September of that year, a well-to-do Spanish family, including six women and ten men, were banished from Santa Fe and traveled northeast to Missouri with a trade caravan. Colonel Jose Antonio Viscarra and 200 men, comprised of Mexicans, “hired whites,” and “hired Indians,” escorted them to the Arkansas River. Another Hispanic woman, among the first women to travel the trail, may well have been Santa Fe native Carmel Benevides, the common-law wife of Antoine Robidoux, a voyageur, fur trader, Santa Fe merchant, and magistrate. Carmel Benevides de Robidoux accompanied her husband on at least six trips between Santa Fe and Missouri. Missouri birth records indicate that Carmel gave birth to a daughter, Carmelete, in about 1830 possibly at either the Blacksnake Hills Trading post in later St. Joseph, or in St. Louis, Missouri. This would place Carmel in Missouri in 1830 and suggest that her first trip over the trail occurred shortly before that time. Carmel and the child were recorded in Santa Fe on the 1841 census, indicating that both had made the return trip. The Robidoux family made additional trips to and from Mexico about 1841 and sometime in 1845. Antoine died on August 29, 1860, in St. Joseph, Missouri. His will listed Carmel as “his beloved wife” and executrix. Her last trip on the trail in the early 1860s was to return to Santa Fe with her adopted granddaughter. Carmel died in Santa Fe on January 29, 1888, at the age of 76. The experiences of the American female travelers are those about which we know most and of which the most written records exist. The accounts of American women like Susan Shelby Magoffin and Marion Sloan Russell are among the most informative accounts of Santa Fe Trail life and commerce. Some sources also suggest that one American female traversed part of the route in the 1840s disguised as a male soldier. Russell traversed the Santa Fe Trail five times, beginning in 1851 when she traveled as a child with her mother and brother. At age 18, Susan Magoffin and her husband Samuel traveled down this route during the summer of 1846. They departed from Council Grove, Kansas and made the journey in 32 days, arriving in Santa Fe on August 31, 1846. At the time, she was considered to be the first American woman to enter that town. In her trail account, Magoffin described her newfound fame saying: I have entered the city in a year that will always be remembered by my countrymen; and under the ‘Star Spangled banner’ too, the first American lady, who has come under such auspices, and some of our company seem disposed to make me the first under any circumstances that ever crossed the Plains. Magoffin’s diary of her 1846 trip was published in 1926; Russell’s memoirs were transcribed by her daughter-in-law in the 1920s and published during the 1950s. Considering the nature of the Santa Fe Trail, “It may appear, perhaps, a little extraordinary that females should have ventured across the Prairies under such forlorn auspices,” but they did. Hezekiah Brake, who crossed the trail in 1858, wrote in his published account that “In those days the women dreaded worse than death, the perils of the Western trails,” supporting the notion that many of the females who crossed the trail did so because of their husbands or families. No doubt some of the dreaded perils were experienced by Magoffin in 1846 when she miscarried while at Bent’s Fort, Colorado after a carriage wreck west of Pawnee Rock, Kansas. The 1830s actually witnessed the first crossing of the trail by a female American citizen. For some time, Susan Shelby Magoffin was considered to be the first American woman in Santa Fe; however, Mary Dodson Donoho, the 25-year-old wife of trader William Donoho, is now believed to be the first American woman to arrive in Santa Fe over the trail. In 1833 Mary Donoho, along with her husband William and nine-month-old daughter Mary Ann, traveled over 100 miles from Columbia, Missouri to join the caravan for Santa Fe at Independence. 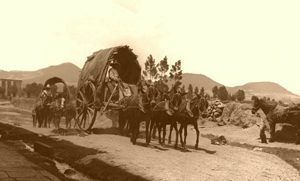 This caravan was composed of approximately 328 people and between 93 and 103 wagons and carriages, of which 63 were laden with a total of $100,000 to $180,000 worth of merchandise. Captain William N. Wickliffe commanded the caravan, which was escorted by 144 officers and men with five supply wagons, one piece of field artillery, and one ammunition wagon. After arriving in Santa Fe, the Donoho family managed a hotel there from 1833 to 1837. Compiled & edited by Kathy Weiser/Legends of America, updated July 2018.